ADP cut the ribbon on its newest global cybersecurity operation Monday, expanding the New Jersey-based company’s already sizable Augusta presence and further strengthening the metro area’s booming cyber industry. The Critical Incident Response Center – ADP’s fifth in the world and second in the U.S. – will help the payroll and outsourced services firm provide round-the-clock digital security for corporate clients worldwide. The response center will help ADP response centers in New Jersey, Romania, India and the Philippines ferret out cybercriminals big and small. “Our threats are broad and wide, from nation-state terrorism and espionage to normal economic and financial crimes to general cyberattacks,” ADP Chief Security Officer Roland Cloutier said during the grand-opening celebration at the company’s west Augusta campus. ADP Vice President Dave Brendza, the general manager of the 1,300-employee Augusta operation, said the Critical Incident Response Center is to corporate security what the National Security Agency operation at Fort Gordon is to national security. Brendza said ADP’s data systems have never been breached. In addition to having an already substantial local footprint, the company chose to locate the cybersecurity center in Augusta because of its quality-of-life, its hurricane- and blizzard-free weather, and its pool of skilled labor created by NSA and U.S. Army Cyber Com­mand operations at Fort Gordon. 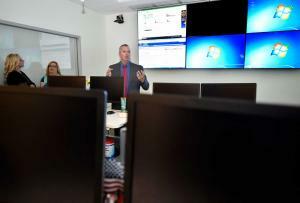 The response center will employ roughly three dozen analysts but could be expanded as the need arises, Cloutier said. ADP, which stands for Auto­ma­tic Data Processing, established operations in Augusta in 2007 at offices on Stevens Creek Road. It moved into its present 160,000-square-foot complex on Interstate Parkway off Wheeler Road in 2009. In September, the company announced a $20 million expansion that would add 60,000 square feet of office space and 600 parking stalls to the campus, enabling it to hire additional staffers and move 200 existing employees from leased space in the former Medac office building on Scott Nixon Memorial Drive. ADP’s Augusta employment will be nearly 1,700 employees when the project is complete in mid-2017.